Some time back, I joined the Science Center group to better be able to pick up on any science-related events I could write on. It was a few weeks ago that I witnessed a Dhann2 Resident, making group announcements, asking for volunteers to take part in an experiment, “Hi! 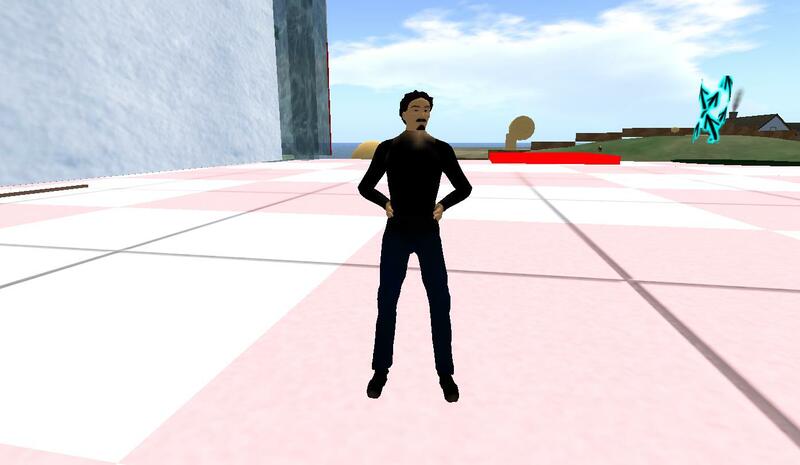 I'm running an experiment in SL in a moment. Interested to join? Please IM me or check out Linden Research Group.” At times, I heard it called a “resource gathering experiment when people asked for details, and Dhann informed volunteers would be compensated for our time. I was initially skeptical about this. But one night I had a few words with Pooky Amsterdamn who encouraged me to give it a try, calling it fun. 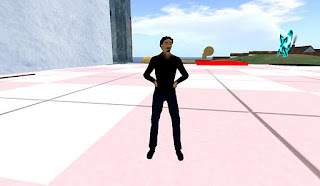 So when Dhann2 asked for a fourth needed volunteer at a time convenient to me, I IMed him saying I was interested and he sent me a teleport to his location at the Limestone Quarry sim. After all four volunteers were present, Dhann gave all of us a participant ID number, “This lets us keep track of your data without using your actual names or identity in our research (e.g., in survey questions). In our research, we will only report aggregate data. We will not keep or report your names or your identity.” This was followed by him handing us an informed consent form, which was basically straightforward. There was no problem with discussing the experiment afterwards, though Dhann did ask us not to say anything to each other during the event, as well as gestures or anything else “out loud.” Attached HUDs or AOs were not considered a problem. Once we all told him we read the form, Dhann told us we could expect to spend about 45 minutes here, “It’s very important that everyone complete the entire session.” He then reminded us we would be getting a payment of Lindens, “based on your earnings, which depend on your decisions and those of others in this study. 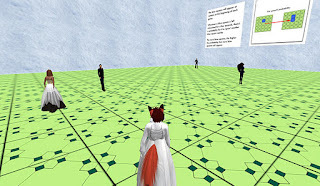 The typical minimum average earnings for each person are around 100 Linden Dollars, but you could earn more or less depending on your decisions and those of the other participants.” A notecard I picked up later stated one could expect to make from 75 to 175 Lindens. Following that, he asked us to type a code word near the “Harvesting L$” sign. When we did that, we were in the experiment room. The floor of the room was made up of green tiles, which looked like wires and circuits were set in them. Signs on the wall explained what kind of “resource gathering” would be going on. The “resources” would be squares lit up as blue. Sometimes, a green square would turn blue, depending on how many blues were around it. If there was just one, there was a small chance. Two or more, a proportionally larger chance. Dhann reminded us of that, plus that we would move faster if our “Always Run” option was set. There would be six rounds of tile gathering, each lasting three minutes. For every three tiles collected, we would be paid a Linden. For the first three rounds, we gathered up tiles without instructions or any verbal communication, chat or IMs. After the third round, Dhann send us a notecard with four strategies on how we would gather the tiles, and asked to vote on it. Following the announcement of the results of the voting, we were also given a link to a survey on the Internet to fill out before the experiment resumed for another three rounds. 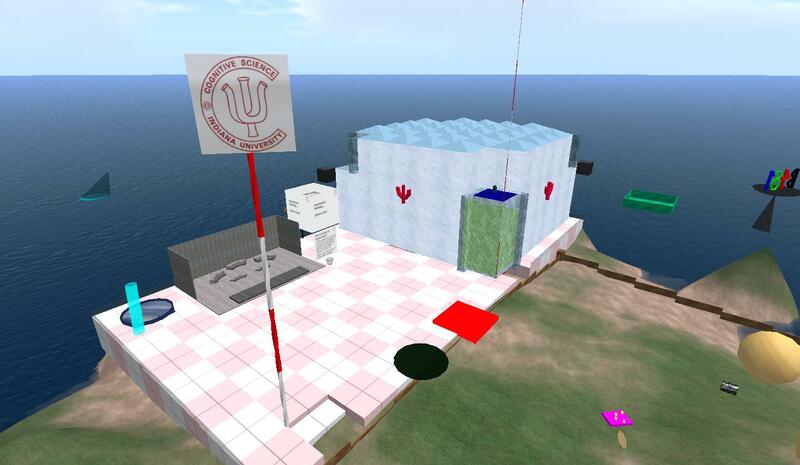 Dhann wasn’t sure exactly when the University of Indiana got started in Second Life, “I joined the research team at Indiana at least a year or two after they started.” There are plans for additional kinds of experiments, “Previously, they ran a series of experiments similar to the one you did today. And we have different versions of this planned for the future. 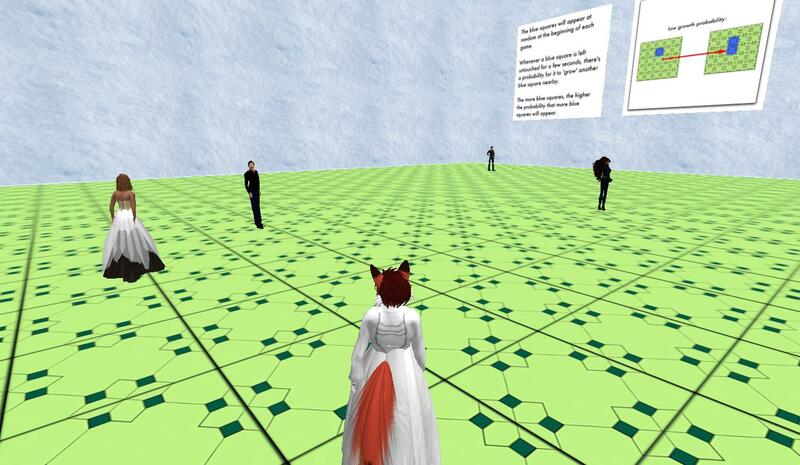 ... We are planning visual perception experiments for SL, should be ready pretty soon. They will take on the form of a museum display. I think participants will be asked to navigate a museum ... Then look at certain objects and answer a few questions about them. That project is currently under construction by a graduate student in the time, and I am not sure exactly what the details are.” Dhann explained details about these future experiments would be announced in the Linden Research group. The experiments are still going on, so if you want to take part, join the Linden Research group to hear of any announcements. For related information, there was a link to the “Percepts and Concepts Lab” at http://cognitrn.psych.indiana.edu .